Models were not always easy for Van Gogh to come across. His mercurial moods and his unusual art style often prevented him from finding people willing to pose for his work. Yet in Arles, Van Gogh made close friends with people who were happy to sit for him – the Roulin family, a group of people who lived only a few houses down from him. Joseph Roulin was the father, married to Augustine. The couple had three children: Armand, Camille, and Marcelle, a baby girl born during the time that Van Gogh knew the family. He created around 25 paintings of the family altogether. His relationship with the Roulin family, particularly his friendship with Joseph, was one of the bright spots of his time in Arles. Joseph Roulin was a postal worker for the railway in Arles. Despite limited finances on both sides (Vincent had 100 francs per month and Joseph Roulin earned 135 francs) both found coin to share a drink and conversation. It was during these times that Van Gogh made himself a stalwart friend who would stand with him through his troubles in Arles and support him unconditionally during his hospitalizations. Even distance was of little consequence. Roulin received a promotion that took him to Marseille, separating him from his family and Vincent. Yet every time he was in town visiting his family, which was any opportunity he had, Roulin would make an effort to see Vincent as well. He praised Van Gogh’s work and thanked him for it. It helped ease his family’s separation as the baby Marcelle “…, thanks to [Vincent], could say hello to [Roulin’s] Portrait even and morning” as they had hung Joseph’s portrait up where she slept (letter 775). Van Gogh described Roulin as having “a big, bearded face, very Socratic” (letter 652). He compares the two men as Roulin and Socrates were both reportedly unattractive and “raging Republicans.” In a moment of the pot calling the kettle black, Van Gogh also called Roulin “something of an alcoholic” (letter 655) in a letter describing the portraits he painted of his friend. He did two of them, as Roulin was “getting too stiff while posing” in the first. In the full-bodied picture, you can see Roulin’s weariness, his face eternally painted in an “Are you done yet?” expression His eyes droop in the full-bodied painting, but his face is “high in color,” as Van Gogh described it, from drink and the birth of his youngest child Marcelle, which made “the good fellow glow with satisfaction.” In the second his face appears more alert, vibrant. Perhaps because he did not have to sit in one position for so long. For me, the best part of both of these paintings is how Van Gogh captured Roulin’s uniform in the full-bodied. 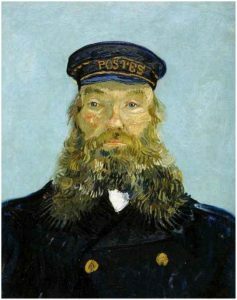 How Van Gogh played light upon it using different shades of blue, how the blue is contrasted by the gold of the trim and buttons and layered golden-brown of Roulin’s beard. Later in their acquaintance, Vincent describes Roulin as a man that “often has to carry burdens which one would say were too heavy… that doesn’t prevent him from always looking well and even joyful” (letter 754). While Roulin doesn’t strike one as a jubilant man in the portraits there is something reliable and warm about his face. In many instances, Van Gogh notes Joseph Roulin is a man that Van Gogh saw not quite as a father, due to Roulin being too young, but “[Roulin] has silent solemnities and tendernesses for me like an old soldier would have for a young one” (letter 754). They continued to write to each other when Roulin moved to Marseille. Although Vincent’s letters from that part are gone, Roulin’s letters to Vincent still exist, as do the ones where Vincent warmly mentioned Roulin to other friends and Theo. It is lovely to see the friendship and esteem both men shared for each other, especially given that it was a tumultuous time of Vincent’s life.